We currently have a number of exciting options available with costs varying according to desired seating categories in our main sanctuary. When purchasing a seat, an initial payment is required with quarterly seat rental costs. 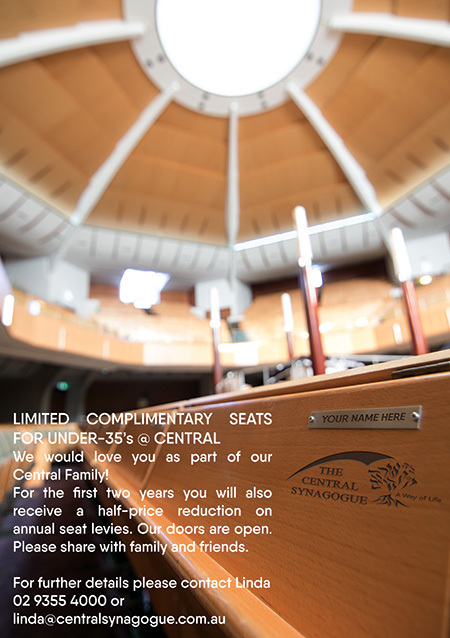 Associate Membership entitles one to a seat in the Overflow Service for the High Holy days as well as discounted rates on function hire, Simcha costs etc. The cost is $500 per person annually. Young Adult Associate Membership for Singles (under 30 years of age) is available at $250 per person annually. This membership offers the same benefits as the standard Associate Membership. We also offer a limited number of complimentary seats in our main spiritual sanctuary for Under-35’s in the Men’s and Women’s sections (replete with gold personalised name plaque). Initial costs are waived and for the first two years, there is a half-price reduction of annual seat levies. This initiative was launched just before the High Holy Days last year, in honour of the community celebrating 15 years of guidance by Rabbi Wolff, Chanie and family. For further information or to view or purchase a seat please call Linda Joselyn (02) 9355 4000.